When I'm not making way through piles of men's grooming products I'm normally on set as a hairdresser. From celebrities like Ashley Graham and Chrissy Teigen to advertising jobs for haircare lines most days you'll find me with a brush and curling iron in hand. I've been working with IMG Model and former Miss Puerto Rico (woohoo!) Monic Perez and her little longer than shoulder length hair has been easy to turn into the soft, romantic but cool waves our mutual client requests. Monic has hmm'd and haw'd about trying an edgier shorter look. It only took a couple months but she finally made the plunge and I think she'll never look back. See her before and after and my tips on styling short hair. Monic came into Kinloch Salon with faded balayage and hair down past her shoulders. We ready for the change and if you are too, there are a couple things you'll want to make sure your hairstylist to make sure you don't end up with a flippy "mom cut". Part of the charm and cool factor of the cut is that there is minimal layering. With that being said, make sure to ask for movement and that your hair has swing to sit. You'll want your hairdresser to bring up your length just short enough that it doesn't feel like a lob but not exactly a bob either. You'll want some face framing but nothing too deep into the hairline so that it takes away the shape of the cut. I have thick curly hair, is this for me? Absolutely. I wouldn't recommend it for especially round faces or someone isn't well versed in the maintenance of curly or thick hair. But if you're a curly girl that loves to rock big hair or not afraid of the shorter length then go for it! Same rules apply with layers but you'll want some movement created in the crown area so that you don't end up with a triangle on your head. After cutting off Monic's length, Kinloch Salon's owner and master colorist (and my longtime friend!) Courtney Lee worked her magic with the color. Known for her perfectly rooty blonde and brunette shades, Courtney highlighted and painted her way through Monic's naturally dark hair. The pops of brown and caramels gave her hair dimension and an added illusion of movement when worn straight. How do I style it?! The key to this length is that it stays cool and effortless. Sleek and straight or soft and wavy is the way to go. Monic's hair was rough dried (use a texturizing mousse like Kenra Professional's Whip Grip Mousse for texture and hold) and then used T3 Micro's new 1.5" Clip Barrel from their Convertible Curling Iron Collection. The bigger barrel size ensures that you won't end up with Shirley Temple ringlets but instead soft, effortless, cool girl waves. Emulsify a texturizing product into the palm of your hands and squeeze into your midlengths and ends for a lived in finish. I really like the Kenra Style Fiber Styler for a glossy but not heavy finish that's full of texture. A severe side part and a tuck behind the ear complete the look. 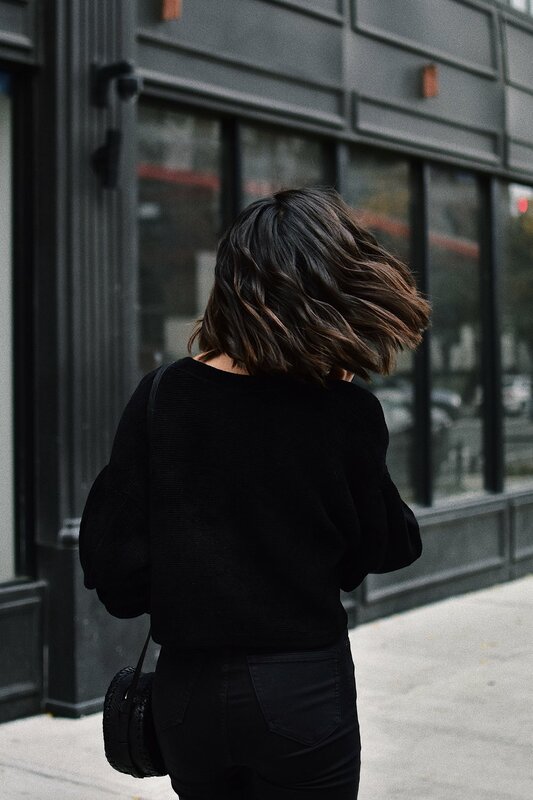 Click through the photos below for more haircut inspo! When in doubt, bring a photo to your hairdresser for reference, print or screen shot any of these if you're thinking of going to a shorter length. What do you think? Will you ever make the big chop?